A mountainous trail ride staying in local guesthouses encountering medieval monuments and welcoming Balkan culture for intermediate riders onwards. 2019: 17, 24, 31 Mar; 7, 14(full), 21 Apr; 5, 19 May; 23 Jun; 7, 21 Jul; 1, 8, 15, 22, 29 Sept; 6, 13, 20, 27 Oct; 3, 10, 17, 24 Nov.
Meeting point: Tirana airport (TIA) or Saranda Port - fly to Corfu (CFU). Mountainous trail ride at a steady pace to the coast encountering medieval monuments, communist past and welcoming Balkan culture. Ride through incredible Andes Mountain scenery at the highest part of the Andes near Mendoza. Highlights for those without the time to cross the full range. A 15,000 acre self sufficient working ranch in northern Patagonia. Ride out each day where the mighty Andes rise up behind you, or ride into the neighbouring Indian reservation. Look out for wildlife of the area, especially condors. Riding Ability Required: All levels catered for, experienced riders separated. Minimum age 12. Transfer: 2018/19: From San Martin (approx. 30 mins) $70 per vehicle each way, payable on-site. Other transfer options can be viewed below the itinerary. Working cattle estancia near Cordoba, Argentina. Ride with gauchos and experience Argentine hospitality, lovely accommodation and learn to play polo. All levels. 2019: Open all year, anytime arrival and departure. Trip Length: Suggested 8 days/7 nights or as you wish. There is a minimum of 3 nights (5 nights over Christmas & New Year). Meeting point: Cordoba Airport, Argentina. Ride along ancient Inca trails in the Andes Mountains where life goes on as it has for centuries. From the dry Calchaquí desert on the west of the Dead Lion Range of the Andes, we cross at 3,000m (9,000ft) where condors roam and descend into a different world of lush green valleys and tropical forests of Lerma. En-route we stay in the homes of the local Calchaqui Indians with 3 nights of camping under the spectacular southern hemisphere stars in the high Andes, an unmissable experience. A relaxed ride with beds and hot showers all or most nights for riders who can walk, trot and canter. Riding Ability Required: Walk, trot and canter on a good horse. Usual Group Size: 4-8. Ride may be confirmed for less than 6 at a supplement, see Prices and Dates tab. Transfer: 2019: Included from Salta for 9 day programme. 12 day programme approximately $60 one way per car (1-3 pax) from Buenos Aires Pistarini (international) or $30 from Buenos Aires Newbery (domestic). A working estancia stay in the heart of the Pampas 3 hours from Buenos Aires. Work with the cowboys, ride a cattle drive and relax under the stars at this genuine traditional Estancia. The itinerary finished with two nights in the heart of bustling Buenos Aires including a city tour, tango show and river trip. The perfect combination to experience Argentina. Tailormade dates also available year-round, please enquire. Riding Ability Required: Comfortable at walk, trot and canter. Transfer: Included from meeting point for 7 day programme, see below itinerary for per night programmes. A six night adventure through the pristine wilderness of Patagonia in Argentina. 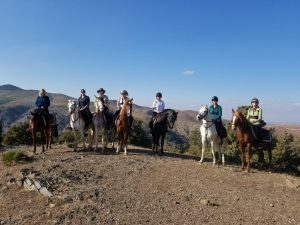 The trails take you over uninhabited land that can only be reached on horseback and the group camp in unspoilt places. On request between 1st November 2018 and 1st May 2019. Riding Ability Required: Novice (confident) but with opportunities for faster riding for more experienced riders. Min age 9. A week dedicated to learning to play polo on a working cattle estancia. Ride with gauchos and experience Argentine hospitality, lovely accommodation. Approximate riding time per day: Flexible, polo tuition every afternoon. The best of both worlds! 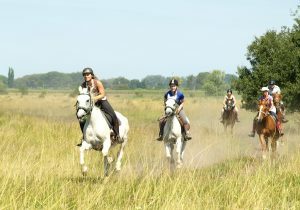 Ride through lush forests and open scrub, then cool off with a gallop along miles of golden sands. Suitable for confident riders keen on long gallops. Beautiful accommodation. 2019: 2, 14, 25 Jan; 10, 24 Feb; 10, 24 March; 11, 25 April; 12, 26 May; 9, 24 Jun; 8, 25 Jul; 8, 22 Aug; 5, 22 Sept; 6, 20 Oct; 3, 17 Nov; 1, 15 Dec. Riding Ability Required: Advanced riders, must be comfortable cantering and galloping in open spaces. Transfer: Included from Port Macquarie Airport at around 5:15pm or Kendall train station at 6:15pm. Drop off on final day 10:30 at Port Macquarie Airport or 9am at Kendall train station.